When a slot is booked, the relative Google Calendar event is automatically updated! Let’s see how a frontend calendar will appear, with some mixed services active (Appointments, Events, Unscheduled services). Navigate through the months and try to make a reservation! 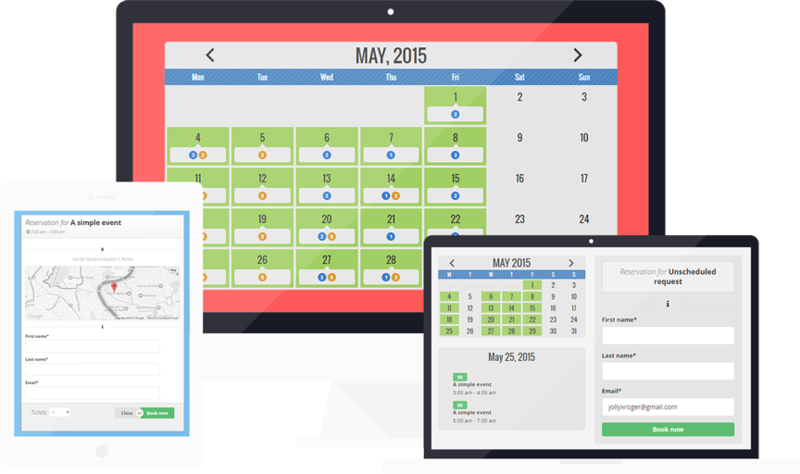 Direct forms are possible for those services which don’t require an availability planning. Think about “support ticket” (no calendar needed), but that’s just an example of the infinite possibilities of this powerful service class! Do you need to show a list of upcoming events instead of the calendar? A fully customizable shortcode is made for that. See how it looks like! Are you alone? Are you working in team? Define your coworkers, let them plan their own availabilities with their Google Calendars, discover all the possibilities! As admin: create and define each service, manage your staff, craft the frontend aesthetics. As coworker: choose the services to join, fine tune the reservation dynamic to fit your needs. Three levels of notification: to the customer, to the service provider, to the admin. Customize the email content, use dynamic data via placeholders, set reminders. An Overview section shows all the reservations along with their details. Sort them, search through them, export them as .CSV or .XLSX*! Each service may have different needs about collecting customer’s data. Team Booking allows you to build a customized reservation form for each of your services. You can create unlimited services: appointments, events or just unscheduled services. The availability can be planned in many ways. Use single slots and/or containers. Decide what the system should do when personal events overlap. And many more. Just add a location to a Google Calendar slot and the map will be automatically shown on your reservation form. Or you can set a fixed default location. Directions are shown in realtime as the customer types his address. Activate the payment support with Stripe and PayPal. You can set each service to ask for an immediate required payment, discretional payment or no payment at all.